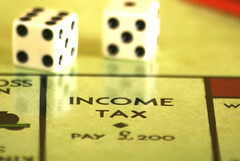 LONDON – Most families in the UK will need to work for approximately 20 years just to pay off their lifetime tax bills. New research released by the UK think-tank the Taxpayers’ Alliance shows that an average UK family will pay over GBP 800 thousand in taxes over their lifetime. The average UK family with a gross household income of GBP 41 027 will pay taxes of GBP 826 030, after adjustment to 2014-15 prices. Based on the income levels and the total tax bill for both direct and indirect taxes, and average family would work for 20 years just to cover their tax obligations. Low-income families with a household earning of GBP 13 841 would see a total tax bill of GBP 319 732, and would take 23 years to work off the obligation. However, families in the top 20 percent of earners, would see a tax bill of GBP 1 686 970 over their lifetime, from an annual income of GBP 86 768, and would take 19 years to cover their tax obligations. For the average family, the total income tax burden would amount to GBP 287 963 after tax credits, while VAT, NIC, and Council Tax would cost GBP 169 371, GBP 107 045, and GBP 65 068 respectively.